Nail the safari-chic look even when you’re in the city with the Corsage Shirt by Zimmermann! Rendered in an iconic zebra print, the chic linen and silk shirt features a front button closure and chest pockets with contrasting buttons. Cut for an oversized fit, hire it for a daytime event or for an off-duty weekend look. Run your weekend errands in style and comfort by wearing the shirt with classic chain link earrings. Check out our blog for outfit ideas to try for the weekend! 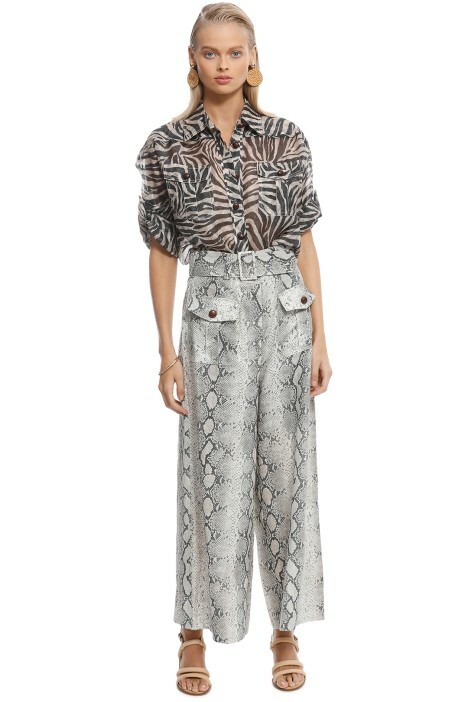 Pair this shirt with animal print pants or try the Corsage Safari Pants by Zimmermann.